Keeping kitchen floors cleaner and safer! Sani-Floor® is the first and only product on the market that is designed to contain the kitchen mess at its source. Food and debris fall into the floor rather than on it. This patented system replaces rubber mats and the hassles that go along with them. 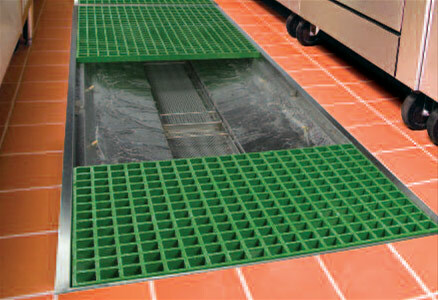 The Sani-Floor grates are non-slip and anti-fatigue which provides a more comfortable and safe working surface. You’ll save significant time and money throughout the day and especially at end of day clean up when all you need to do to maintain Sani-Floor is empty the strainer tray and run the grates through the dishwasher.